Ladybird the Peagle puppy at 6 weeks old—"Her mom is a Pekingese and her dad is a Beagle." Ladybird the Peagle puppy at 13 weeks old—"Her mom is a Pekingese and her dad is a Beagle. 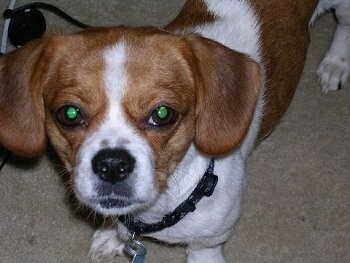 She looks most like a Beagle and sounds like one when she barks." Ladybird the Peagle puppy at 6 months old stretched out in a frog-leg pose—"She sits in a very strange way, as you can see in this picture." Ladybird the Peagle puppy at 6 months old—"Can you tell she's just a little spoiled?" 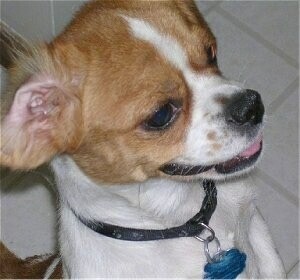 Penny the Peagle (Beagle / Peke mix breed dog) at 6 years old—her mom is a Beagle and her dad is a Pekingese.